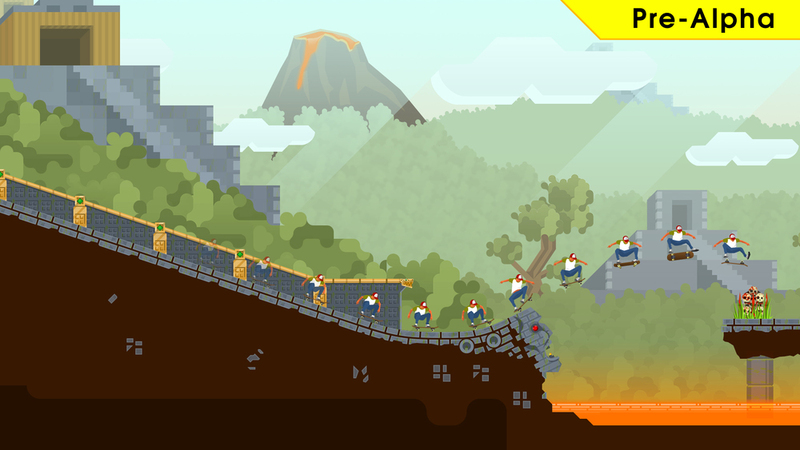 Roll7 have just announced OlliOlli2: Welcome to Olliwood, the sequel to OlliOlli. You can find our thoughts on the first game below along with all the details on OlliOlli2! Following the MASSIVE international success of their debut console title OlliOlli on PlayStation and PC, London based developer Roll7 is proud to announce they are working on a sequel to the twitch score-attack hit - OlliOll2 : Welcome to Olliwood. The iconic ‘skater’ is going all green-screen and getting radical at Olliwood Studios, plucking the player from the street and dropping him squarely in the middle of the Big Screen’s most bodacious cinematic locations. To accommodate the sheer volume of action, the ‘skater dude’ and his pixelated world are being given a stunning new art makeover, with clean lines, gorgeous new backgrounds and über detailed trick animations (over 9000 EXTRA frames of hand drawn goodness!). OlliOlli2: Say Hello to Olliwood and Goodbye to your Analog Stick!